Although it’s been a while since I’ve done any “real” work in AutoCAD, the other day I had an opportunity to fire it up and use one of my all-time favorite commands in a workflow that I was documenting for a customer. This command was implemented over 22 years ago and to this day I still find it very useful even though it has been replaced by another command. The command I’m referring to is called FILTER. I always felt the FILTER command never got the justice it deserved. From its introduction 22 years ago to AutoCAD 2015, in my opinion it still portrayed as an AutoCAD secret. Did you know it exist? Have you ever used it? The command, by simple terms, is defined as a function that allows the user to create a selection set based on filters that you assign. Let’s say I have a drawing of a mounting plate that contains ten holes and each hole could have different diameters, colors and/or be assigned to certain layer. For my example I’ve been instructed to remove all the holes that have a diameter of .5in, red in color and belong to layer called “Mounting Holes”. Looking at the plate, could you figure out which holes meet that requirement? Well if we spent some time we eventually could determine which ones fall under this criteria. However, in this case I’m going to enter FILTER on the command line and let AutoCAD do the work for me. 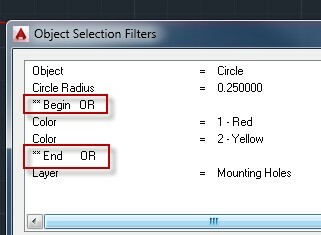 First let’s start out by defining the object we are looking for by selecting the filter drop-down list and picking CIRCLE. Next select the “Add to list” (button) and our first object filter is now defined. Now I want to add another filter that only looks for circles having a radius of .25in (diameter of .5in). 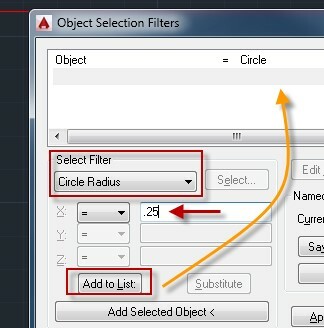 Note: Although I like to first define the overall object I am looking for, if I actually defined the circle radius instead, AutoCAD would automatically apply the circle object filter for you. Next I will repeat the process and only look for .5in diameter circles that have a color of “RED” and belong to the layer “Mounting Holes”. 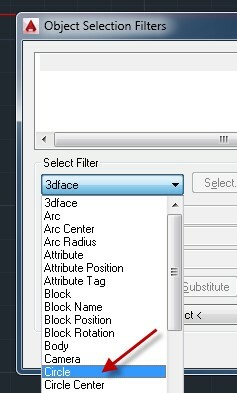 Once I finished my filter list, I select the “Apply” button and the selection set is created. However, at this point I am still in the command and I must exit it by hitting the <ENTER> key. From there I can now start the ERASE command and when prompted to select my objects, I simply enter a P (previous selection) on the command line, hit the <ENTER> key and presto all the holes meeting my criteria are selected and are ready to be removed. But lets take it a step further and now remove all .5in diameter circles that are yellow, red and reside on the layer “Mounting Holes”. In this case we will have to use a filter choice of “BEGIN OR” and “END OR” to define the two colors we’re looking for. Note: When using any of the filter choices, it’s very important to begin and end it with the same function type. Failure to following this will only lead to issues and an incorrect selection set. Now when I use the previous selection set under the ERASE command, all of the holes meeting this new filter requirement are selected. 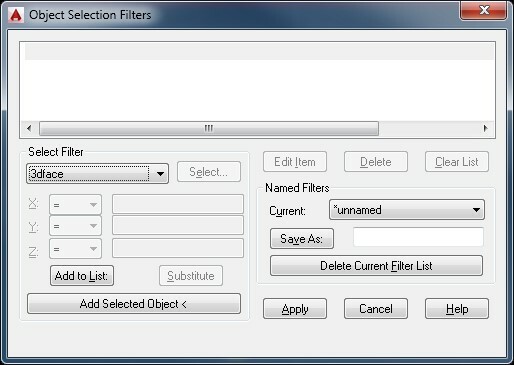 A different filter list can be configured for each drawing you have opened. 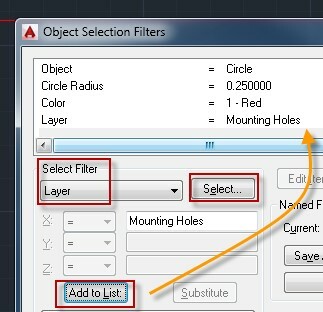 A filter list stays until its cleared or you exit AutoCAD. A filter list can be saved for future usage. Its definition resides in a file called filter.nfl and is found here: C:\Users\\AppData\Roaming\Autodesk\<AutoCAD Product>\\enu\Support. 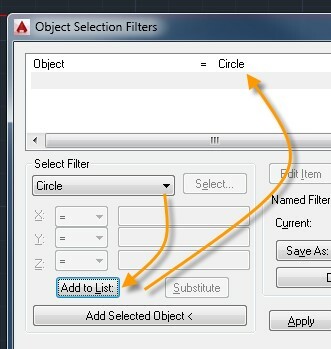 A filter list can be configured and modified by selecting an existing object. Can be used as a transparent command (‘FILTER). The FILTER command to me has a lot of possibilities and it’s always been a time saver when trying to define a specific selection set. 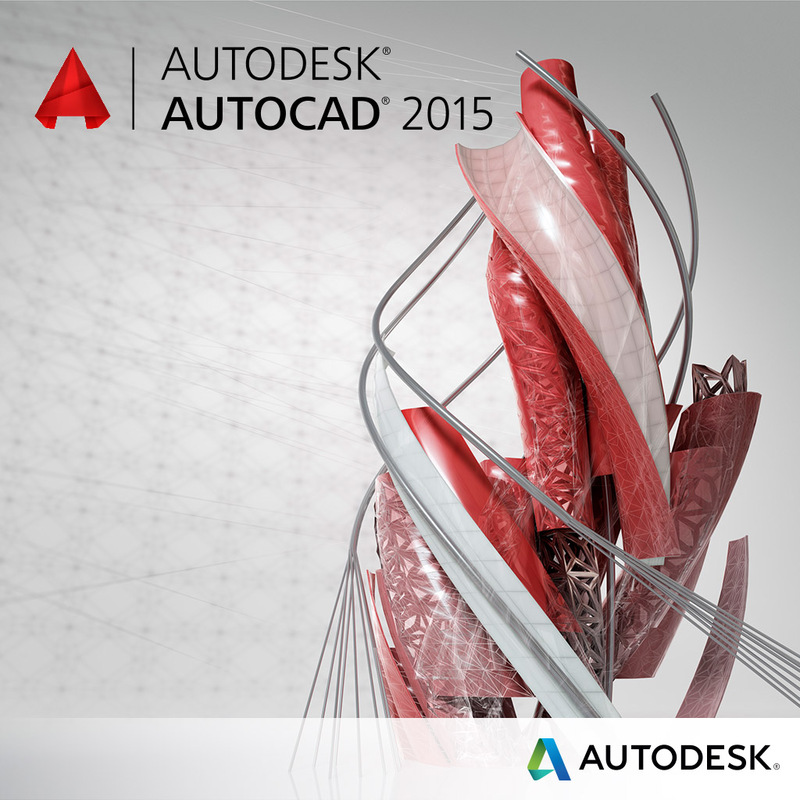 Hopefully you will feel the same and categorize it as one of your favorite AutoCAD tools as well. 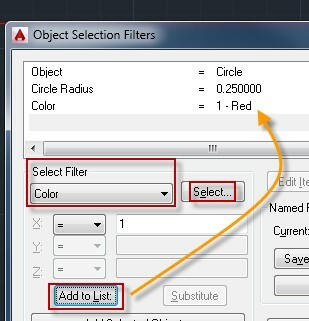 Do you know where the FILTER command is located on AutoCAD RIBBON (or menu)? Well stop looking!!!! The FILTER command has not appeared in any menu, toolbar, or ribbon since AutoCAD Release 14. Either create your own ribbon icon for it or type the command directly on the command line. In the beginning of the article, I stated another command had really replaced the FILTER command, do you know which command I’m talking about? The replacement command I’m referring to is called QSELECT and it can be located under the Home/Utilities ribbon section. NICE ONE THERE MARK. KEEP IT UP.